The Kerala men’s team, sans two senior players Vibin George and Rithesh, still looks quite competitive. Going for a hat-trick, the seven-time champion played a compact game to outwit Karnataka 25-18, 25-20, 25-21 and start its Group-A campaign on a bright note in the senior National volleyball championships at the Nehru Indoor Stadium on Thursday. Though each set was fast-paced and pretty even, Kerala upped the ante when it mattered and all credit to attacker G.S. Akhin and blocker Sarang Santhilal for pulling the team through tough situations. Though Karnataka trailed by only a point both in the first (15-16) and second (16-17) sets, it couldn’t rise to the occasion when the sets entered the closing stages. As coach K.R. Lakshmi Narayan observed, the team missed the services of Anup D Costa, who had met with an accident prior to the event. Karnataka played its best in the third Test with central blockers A. Karthik and Ashwal Rai attacking and blocking with conviction. At 18-19, Kerala accelerated with G.S. Akhin and Ajith Lal smashing with impunity. Earlier, the Tamil Nadu women went down tamely to West Bengal 25-23, 24-26, 25-14, 25-11 in a Group-A contest. The local team had no business to lose the first set especially after leading for the major part. Leading 16-13 and 19-16, the host failed to apply itself. Though the host won the second, it failed to capitalise on the momentum. Puja Dalui and Aneena Shaji took the match away from Tamil Nadu. With setter Juhi Shaw’s guidance, Puja and Aneena blocked and smashed their way to success. One felt that, unlike its opponent, Tamil Nadu lacked a good attacker to finish points. 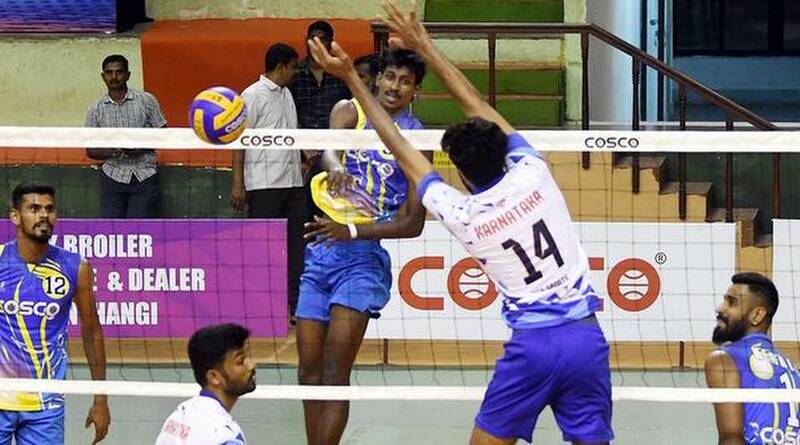 The results: Men: Group-A: Kerala bt Karnataka 25-18, 25-20, 25-21; Group-B: Railways bt Andhra Pradesh 25-17, 25-19, 25-21. Women: Group-A: West Bengal bt Tamil Nadu 25-23, 24-26, 25-14, 25-11; Group-B: Maharashtra bt Karnataka 25-13, 25-18, 25-18. On Wednesday: Men: B: Services bt Haryana 25-18, 19-25, 25-15, 26-24; Women: B: Kerala bt Telangana 25-11, 25-16, 25-15.